For the first time in Scandinavia, a self-driving bus will mix with other traffic along a public road in Kista, northern Stockholm. The electric bus will take up to 11 passengers and will reach a maximum speed of 20 kilometres per hour, on a 1,5 kilometre straight road between Victoria Tower and Kista Centrum in Stockholm’s own silicon valley. The pilot project will try out out the technology over the next six months on normal road conditions on weekdays from 7 am to 6 pm. 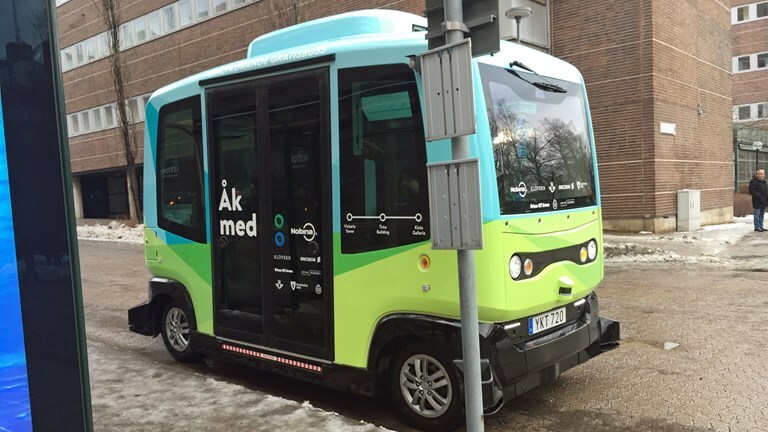 Already at the end of the summer, in a new residential area in Barkarby northern Stockholm, self-driving buses are supposed to be part of the normal public transport route. “If that is successful, I would say that in just a few years, this will be a very common part of Stockholm transport system,” says Kristoffer Tamsons, Stockholm’s regional transport commissioner, and chairman of Stockholm transport. Radio Sweden went for a test drive, and spoke to some of the people involved in the project.